If your data doesn’t exist in at least three places, your data doesn’t exist. That’s the line I once heard on the BBC technology series Click and I haven’t forgotten it. If you’re running a small business, you’re almost guaranteed to be using a computer. Therefore, you have data, and it’s wise to have a backup policy to make secure copies of anything and everything. I keep backups of my accounts, records and digital copies of receipts. I also have password protected customer management databases where I keep details of people I have dealt with. Imagine if all of that got lost or destroyed. Then there’s the numerous websites I’ve created, the hundreds of thousands of words of content, graphic design files, videos, music and everything else. Backing up to DropBox is something you can do, but the free version is limited. USB flash drives are good for day to day data transfer but space is limited. The amount of data we’re all creating is something many of us don’t give much consideration to. Where will it all go? Consider investing in an external hard drive to avoid any data loss drama. You don’t need to spend a fortune. The Seagate Expansion 2TB backup drive is a USB 3.0 device and is inexpensive (Affiliate link). I bought this from my local Argos outlet during an emergency. I wasn’t prepared to wait for it to be delivered. Having this hardware is more about piece of mind. You want to run your business with confidence, knowing that if something happens to your computer, it’s all backed up. You’ve probably experienced a tragic computer meltdown in the past and don’t want to repeat the experience. Dealing with the loss of treasured documents and photos is a painful bereavement that never gets easier. I’m not afraid to tell you I’ve had tears in my eyes on more than one occasion following a computer meltdown. If you didn’t know, 2TB is approximately 2000 GB. This is a good sized disk. This is large enough to backup the ENTIRE contents of two PCs and still have room left over. If you think this is still not enough space, you could get the 4TB version of the hardware. 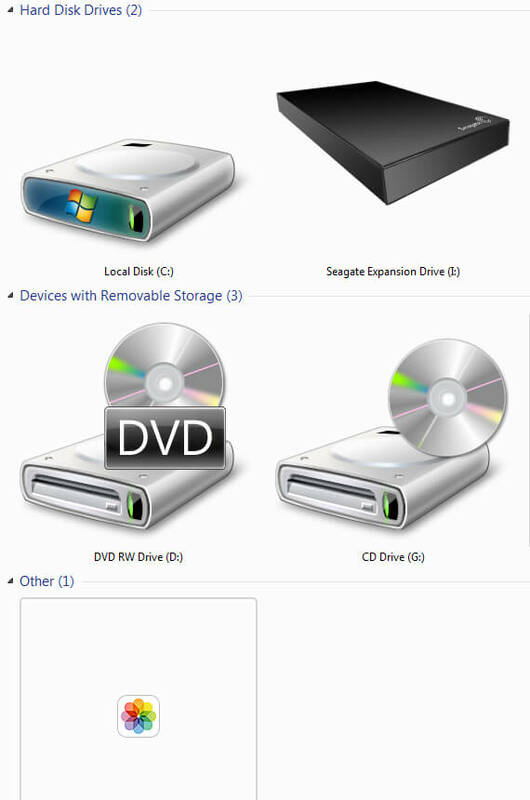 To put it into context, let me give you some examples of storage capacity in PCs and mobile devices. The first PC I ever had in 1997 have a 6GB hard drive. 3.5 inch floppy disks were 3.44MB. The next PC I owned in 2001 had a 20GB hard drive. The ZIP disks I used at university were around 100MB. My iPhone has a 16GB hard drive. My iPad has a 32GB hard drive. My current PC has a 1TB hard drive. I purchased another PC with a 2TB hard drive. 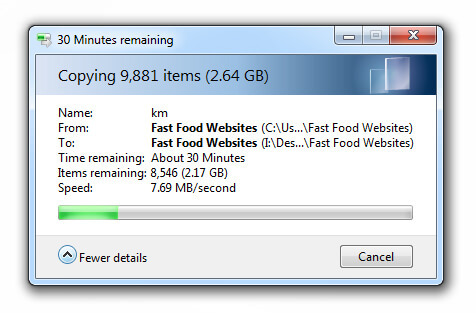 You can probably now understand why I’m so pleased with the 2TB external storage drive. There are no drivers required to use the Expansion. You just plug your USB cable into a spare USB port and plug the power source into a socket. If you do not see the pop up above, go to the Windows start menu and Computer. If the device has connected properly it will have been added under Hard Disk Drives. If your computer has USB 3.0, you can expect the data transfer rate to be lightning fast. Assuming you bought your PC in the last year, it probably comes with UsB 3.0 as standard so you can expect back ups to be pretty quick! Be aware that if you plug the device into a USB port that is not USB 3.0, you could see a slow data transfer rate. Compatibility Problems with Windows Backup! 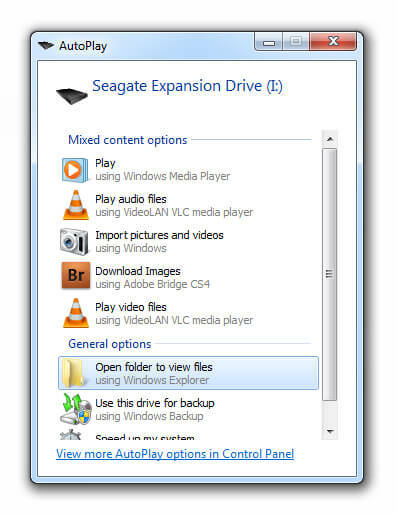 I used Windows 7 Backup and Restore to create a system image. It turns out that Seagate’s drives don’t work with Microsoft’s backup utility, producing Error code: 0x8078002A. If you’re going to buy this drive wanting to create Windows backups, you’ll have to use a third party backup tool instead. 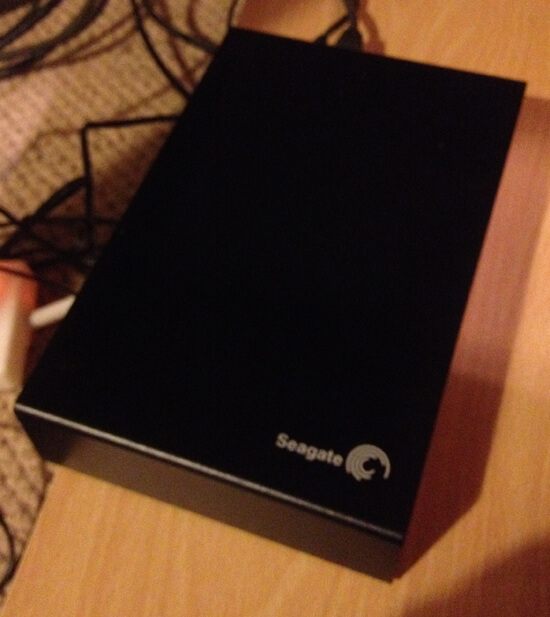 Seagate have released one that works. 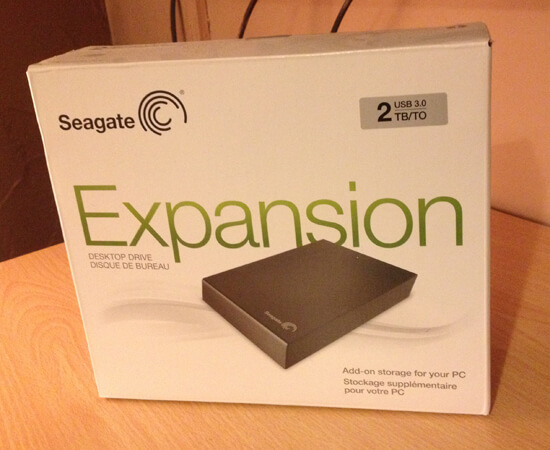 You can purchase the Seagate Expansion on Amazon. 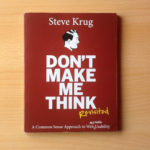 (This is an affiliate link.) Be sure to purchase the correct plug type for the country you’re in. Maybe you already have a backing up system. I know some people use the cloud services like Amazon S3 and DropBox for business, but do you really trust the security of remote servers? Tell me what you do to make copies of your valuable business data and share any tips or insight you have.